Another day, another awful Christmas novella. What the hell? Is there something in the water this year? Why are there seriously no good Christmas books coming out? 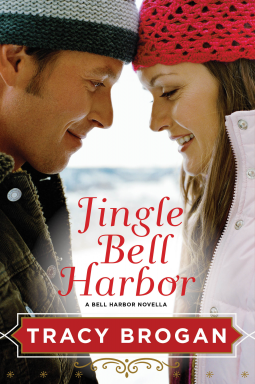 Jingle Bell Harbor is a Bell Harbor novella and the first (and only) Tracy Brogan book I have ever read. It focuses on Kelsey Parker and Drew Hampton. Kelsey works at a year round Christmas store (who knew such a thing even existed?) and has become a bit of a grinch about anything Christmas related. She and her boyfriend are not working out, but he's also her boss, so that definitely complicates matters. Things only get worse when the boyfriend decides to go on their Hawaiian vacation without her after her grandmother breaks her hip and she needs to go home to take care of her. Enter Drew (whose name I keep thinking is Ben, so yeah). He's a biology teacher at the local high school and also somehow works at a Christmas Tree lot. Drew had a huge crush on Kelsey when they were in school together and even pretended not to be good at science to get near her (maybe Ms. Brogan really liked Mean Girls). I didn't feel anything while reading this book. Kelsey annoyed me with all of her anti-Christmas crap and her indecisiveness where both her job and her boyfriend are concerned. My biggest issue with her, though, is the fact that she has no compunction about sleeping with Drew while still technically dating Blake. There is no excuse for cheating. None. It doesn't matter that you're 95% certain that you're going to break up. If I was Drew, I wouldn't trust her. Once a cheater. Always a cheater. The one good thing to come from this book is that we finally got the answer to a question The Gilmore Girls posed way back in 2001. Who decorated the Liberace room? Jingle Bell Harbor is available for Pre-Order and will be released on October 20th.